How Many Calories Does Yoga Really Burn? 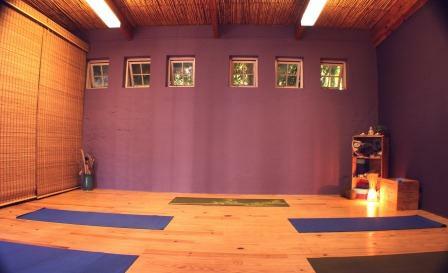 Yoga With Nicci classes are filling up! In all honesty, those pictures scare the living daylights out of me – I cannot imagine how impersonal it must be to teach or take a class in that sort of place, but that’s just me – each to his own. I also wonder how any teacher could possibly keep an eye on all the students and give any sort of tailored feedback in that sort of setting. I can fit 12 people max into my studio, but it feels really comfortable at about 8, so fortunately Yoga With Nicci will not be losing it’s personal touch anytime soon! 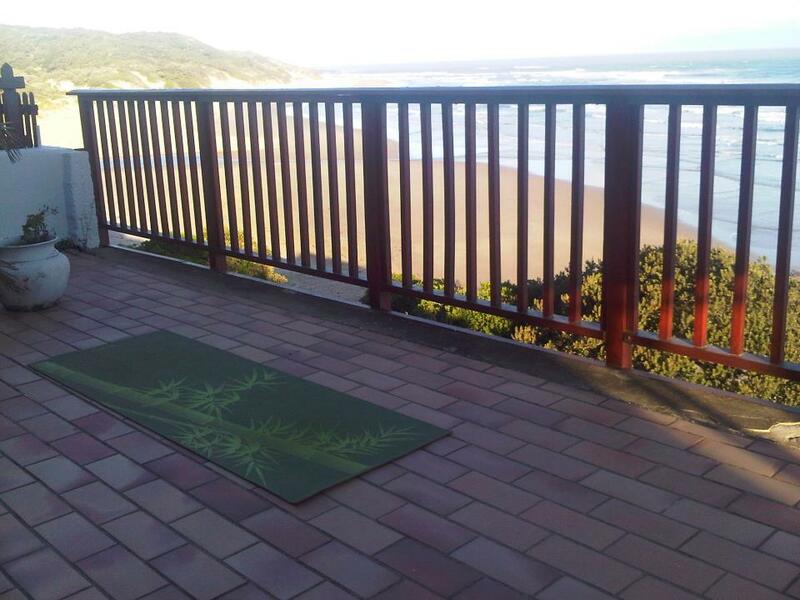 I had a wonderful time keeping up with my own home practice whilst on holiday, typically doing it on the balcony as the sun rose in the East, before my children woke up, and it was a very special experience, practicing my own Ujjayi breath whilst having the roar of the Indian Ocean in my ears throughout my practice. Below is a picture of my makeshift studio at Morgs: brings back happy memories! 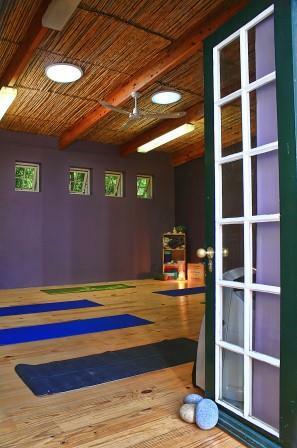 This studio is situated 16 Die Laan, Stellenbosch. 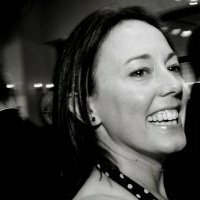 Nicci has a beautiful studio in the wonderfully historic area of Stellenbosch where she teaches Hatha Yoga in the Integral Vinyasa style. 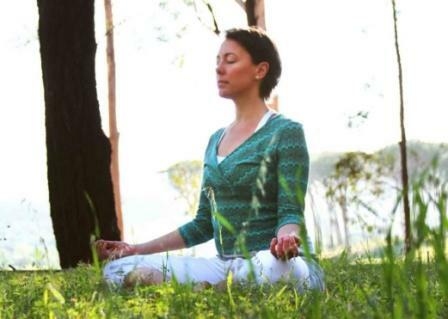 She teaches a gentle style of yoga with a lot of emphasis on warming up the body thoroughly before and throughout the practice, so the risk of injury is minimal. 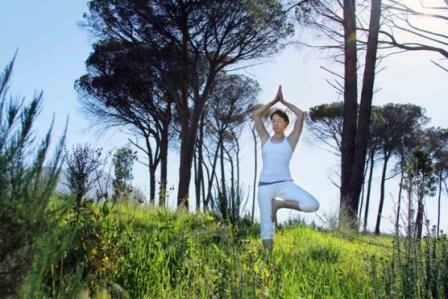 Whilst you enjoy all the benefits of a wonderful physical workout, the emphasis is on mindfulness and constantly bringing the awareness back to the breath: the focus of the practice is to bring mind, body and spirit into a state of balance and harmony. Every class ends with a period of relaxation, which is one of the most important elements of the class. There is ample, free parking and a separate, private changing / shower area. 3. What style of yoga do you teach? I teach Hatha yoga in the Integral Vinyasa style. 4. Where do you teach? At my studio in a beautiful leafy street in the centre of historic Stellenbosch. 5. How long have you been practicing yoga? For almost fifteen years. 6. How long have you been teaching yoga? I’ve taught informally friends and family for a number of years, but have been officially teaching since May this year. 7. Who have you trained with and where? I attended an intensive Teachers’ Training Immersion course in Santa Monica in 2007 with Patti Quintero and Billy Asad, and after moving back to South Africa in 2008 and having my two beautiful children, I completed my 200 hours YTT with Anne and Martin Combrinck at Ananda Sanga in Somerset West earlier this year. I will have gained my certification for specialised prenatal yoga teachers’ training by the end of December, having just completed this course, once again with Anne Combrinck at Ananda Sanga. 8. What lead you to teaching yoga and at what point did you decide that you wanted to teach? I have been inspired by a number of incredible teachers through the years and have been humbled by their wisdom, how much they could teach me, and what a difference they made to so many lives, on so many levels – physical, emotional, spiritual. I started toying with the idea of teaching when I lived in California, and it was after attending the Immersion Course with Billy and Patti that I knew for sure that this is what I wanted to do with my life. 9. What do you love most about teaching? It’s hard to pick only one thing! I love being able to share my passion and to spread the word about how yoga can transform lives. But if I have to choose one thing, it would probably be the beautiful sense of peace and calm that fills the studio at the end of a class – the way that yoga has the ability to calm and restore even the most frazzled mind and body. 10. What do you love most about yoga? I love the fact that it is such an ancient philosophy, yet is so relevant to modern life. 11. What is the greatest challenge you have overcome with the help of yoga? I struggled for a long time to make peace with the idea of God, a greater force, the powers that be, call it what you will. I was spiritual but didn’t want to label myself or put myself in a box. I felt uncomfortable with how judgemental orthodox religions could be. I felt confused as to what the ‘right’ answer was, and how to make sense of this niggling feeling that there must be more than the ‘here and now’, yet how it could possibly be just one answer or explanation when so many people believe such different things. Yoga gave me a way to understand that there is a spiritual unity behind all the diversities in the entire creation and that ultimately there is a way for all to live harmoniously as members of one universal family. 12. What advice do you have for people who have never tried yoga? Take off your shoes, open your mind and just try it. It may be the best thing you ever do. 13. Do you have a regular practice? With two very busy children under the age of 3, it’s sometimes a challenge to find a regular time, but I do my best to incorporate it into my daily life. 17. What are your other interests? I’m an Infant Massage Instructor and the whole space of mums and babies is one of my great passions. I love reading, walking in the mountains, playing my guitar, spending time with my family and friends. 18. Any thank yous? My wonderful husband who has supported me both practically and emotionally in following my dream of becoming a yoga teacher. My parents for selflessly offering me the space for my studio. And all the wise teachers who have gone before me and paved the way for me to continue my own journey.